Leaflet of the lecture performance. The Carmen myth is invariably connected with dance. Carmen is a Gypsy who dances and seduces men through her body. In Prosper Mérimée's novella (1845), which is at the origin of the myth, Carmen's appeal resides in the way she moves and dances. In Georges Biste's opera (1975) the mezzo-soprano who interprets Carmen has to dance at the beginning of the second act. From these works, the figure of Carmen has crossed the boundaries of literature and opera to move towards those of cinema and dance. In particular, in dance history choreosophers such as Roland Petit, Antonio Gades and Mats Ek have reinterpreted the myth of the Spanish Gypsy, each giving his own perspective, deforming and reinventing the story. The relationship with dance is twofold as it can easily become a stereotypical vision devoted to reifying the female body, reducing it to an object of desire. Michela Fossà, Rosella Simoanri, and [Nooz], photo M. Piccinini. I have been studying the Carmen myth for quite a few years now, having taught a module on it at the Dance and mime course, University of Macerata (2005-2006 academic year), wrote my MA thesis about it (2006) and wrote a couple of artciles (here the link to one of them) and an essay on it (here the link). 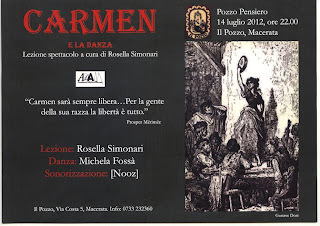 In 2012 I created a lecture performance on this topic, titled "Carmen and Dance", which has been presented as part of an art festival in Macerata (here the link to the photographs of the event). With it I intended to explore the relationship between Carmen and dance in the novella, the opera and in the above-mentioned choreographic peices, with an added reflection on the relationship between woman, dance, body. It has been thought to let three languages interact in the same space and time: the verbal, organised by myself, the corporeal, danced by flamenco dancer Michela Fossà, and the aural, played by dj [Nooz]. Michela Fossà during the lceture performance, photo M. Piccinini. On December 27th, 2013, this same lecture will be again re/presented at Sca Tnt, in Jesi (Ancona).